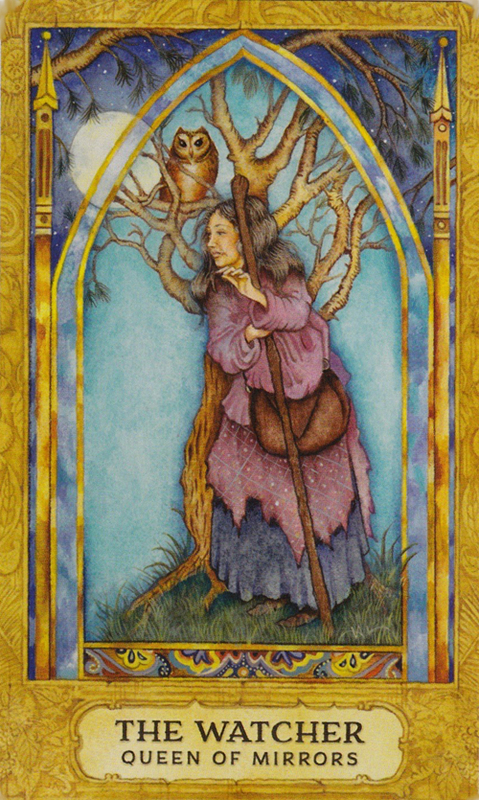 The Tarot card shown here is from the beautiful Chrysalis Tarot Deck, created by Toney Brooks and Holly Sierra. I pulled this card specifically to provide a special message for this post. 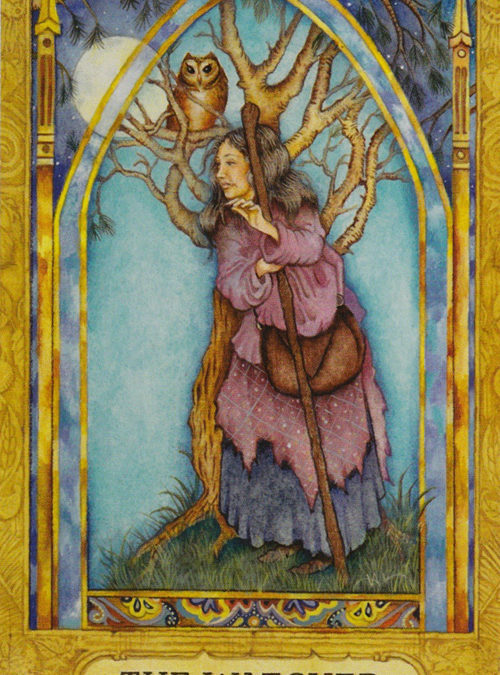 This card, The Watcher, who is also known as the Queen of Mirrors or the Queen of Cups, represents the Crone archetype who is being accompanied here by her Owl, who symbolizes wisdom, magic, intuition, change, and the ability to see what others cannot see. The Watcher/Crone encourages us to tap into our intuition and learn how to ‘see’ and listen and be guided by our intuition. Everyone has a powerful intuition that we can call on and tap into to help us gain clarity and live a soul-centered awesome life. 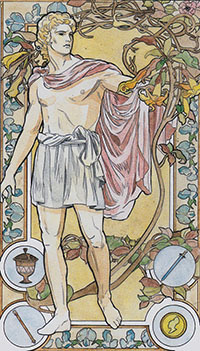 The Watcher reminds us of our ability to be creative. She encourages us to draw on our creativity when we need a break or a distraction from our daily life, or when we are struggling to move forward. She also reminds us of our deep connection with nature. Spending time in nature, connecting with nature through gardening or taking care of animals, or hiking, or just spending time outside, can increase both our creativity and our intuition. To benefit from the wisdom of the Watcher, we must keep an open mind about all of this and try not to allow our limiting beliefs or negative attitudes close us off from enjoying activities or circumstances or experiences that can be amazing and meaningful for us. I’ve been reading Tarot cards for over 30 years now. For the first 20 years I just read for myself and family. Although these readings came straight from the Tarot manual (I didn’t know how to use my intuition back then), the essence of the readings were surprisingly accurate, even when they contradicted reality or indicated things to come. However, several years ago, I decided to learn how to read Tarot intuitively, and for the last 10 years or so I’ve been reading professionally. 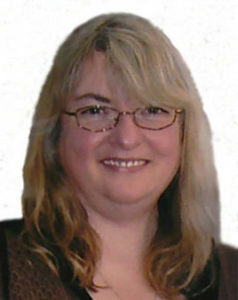 Even after all these years, I still really love the Tarot and enjoy doing readings both professionally and for myself. I was diagnosed with an auto-immune illness a few months ago. Ever since the diagnosis I have turned more and more to Tarot for answers to questions regarding to how to live my new normal and create an awesome life despite the unfamiliar challenges and the physical limitations. Using Tarot for clarity regarding this unfamiliar situation has really helped me focus my energy and manifesting on things that are helping my new life, and not waste my limited trying to manifest things I either don’t really want or are not as useful as I thought they might be. It’s amazing how we think we want something, like more money flowing into our lives, but when we take the time to really explore what we want, we often find that money is simply an easily identifiable symbol for what we really want. What we might actually be looking for is freedom, or adventure, or engaging hobbies, or relief, or an ideal relationship. “Money” can represent so many different concepts, that trying to manifest “Money” may not provide what we were looking for. What Tarot does (and has dome for me on many occasions) is to cut through the illusion and bring what we really want to manifest in our life to our attention. When I first started reading Tarot cards, I almost gave up, thinking that it was too difficult. After all, didn’t a Tarot reader have to memorize the meanings of all 78 cards? Or at the very least, didn’t Tarot readers have to have psychic or intuitive abilities that connected them with the cards? What I have discovered over the years is that anyone can learn how to read Tarot cards. We all have intuition and that intuition can be developed by reading Tarot cards. In fact, there is a kind of feedback loop that happens when we practice reading Tarot cards. By reading Tarot cards we improve our intuition. By improving our intuition we read the cards more effectively and more deeply, getting more information out of even a single card. 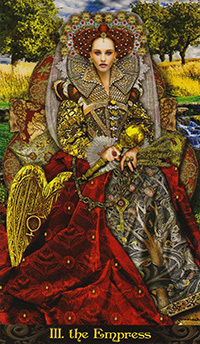 Plus, the intuition we develop by reading Tarot cards can be used in many other areas of our life. There is no magic or special psychic abilities required. In the beginning, reading the cards can be as simple as ‘seeing’ the story that each card tells by reading the symbols and the images that are depicted on each card. A really good, intuitive Tarot reader will help you cut through self-deception, indecision, and confusion, and provide you with the clarity you need to create the life you want to manifest. 1) Intuitive Tarot Readings. 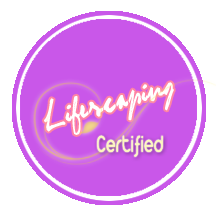 I am currently offering six unique 6-card Tarot Readings, with more being added on a regular basis. These can be found online at: https://www.annebolender.com/tarotreadings. 2) Tarot Card Reading Lessons. If you are interested in learning how to read Tarot Cards, I have a one-to-one Tarot class that teaches the basics in Tarot Reading. 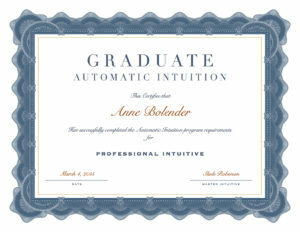 If you are interested in finding out more about this class, email me at anne@annebolender.com.